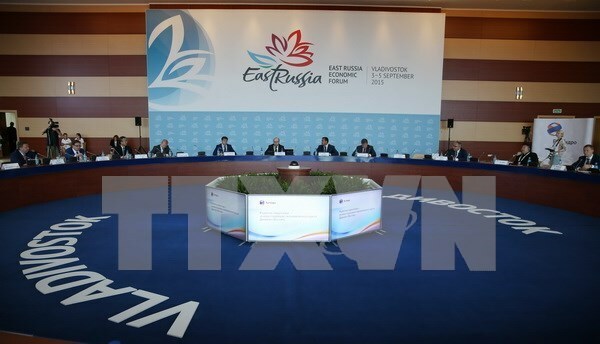 Minister of Industry and Trade Vu Huy Hoang joined about 5,000 delegates from 30 countries and territories at the Eastern Economic Forum 2015 in Vladivostok, Russia from September 3-5. Speaking to Vietnam News Agency correspondents in Russia, the minister said that Russia’s organisation of the forum has proved that despite Western economic sanctions, Russia is still an attractive destination to investors. Russia is not alone in the process of economic cooperation with the outside, he added. According to Russian Deputy Prime Minister Yuri Trutnev, about 80 economic deals worth 1.3 trillion ruble (about 19 billion USD) were signed during the forum. The highest success of the forum is drawing investors to the Far East of Russia, he said, adding that the event saw much higher number of participants than expected. He also revealed that the Far East Development Fund plans a number of projects valued at 190 billion ruble in Vladivostok, with priority on infrastructure. Moscow is also negotiating with Asian partners in refilling the fund, he added.